Houses & Homes VA: Have You Mowed Your Roof this Summer? 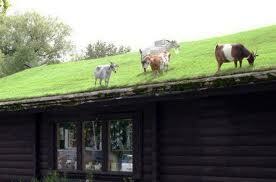 Have You Mowed Your Roof this Summer? I don’t know if you’ve heard of an ecoroof before but this is new to me! Am I behind the times on this? Apparently there is a developing trend where people are replacing their traditional roofs of tar or asphalt with a layer of soil and plants? Ummmm…… Ok (I guess). I don’t know where this new eco-friendly house cover is making a big splash but I haven’t seen one yet. I’m told that these ecoroofs are all the rage amongst those of us that are making a big effort to “go green”. I’m all for being friendly to our environment but being able to count real sheep when I can’t sleep might be taking things a bit far for my taste! The real advantage to an ecoroof is that unlike a standard roof where the water needs to go somewhere this roof will absorb most of the water. Theoretically this reduces the amount of water entering our public sewer system mixed with the usual antifreeze, oil and other contaminants. This organic roof will also filter out pollutants in the air and produce much cleaner water. The actual construction of an ecoroof consists of soil on the top of a spongy material such as carpet padding and then a waterproof liner (such as a pond liner). This provides a natural home for wildlife and believe it or not serves as an excellent insulator. There are a few important things to consider if you are seriously contemplating an ecoroof for your home or structure. An ecoroof is very heavy so you need to be sure that your existing roof can handle the load (not to mention the sheep). You’ll also want to select the right plants for your flowery house cover. You wouldn’t want your neighbors to have Bermuda grass while you were stuck with your average everyday run of the mill lawn as your “house hat” would you? That could cause problems with your HOA. Finally, as always there is the issue of cost. A professionally installed ecoroof is more expensive than a traditional roof but it will last about twice as long. That doesn’t include the cost of feed for your new housemates but I figure “nothing ventured, nothing grained”, right?